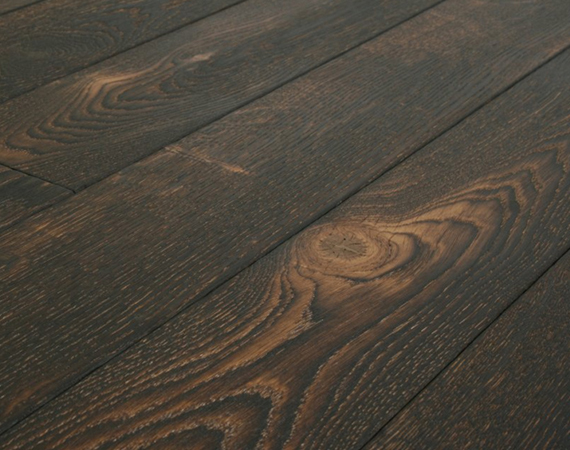 Created from our Dark Brushed & Burned board, Homero has a deep surface texture reminiscent of timber gently eroded by the sea over many years and a slightly softer tone. Beautifully tactile and naturally anti slip this is a fabulous floor for bars and reception areas in commercial spaces as well as in any residential interior. Homero Oak flooring is created from our Cottage grade oak and features large and small knots as well as natural colour variation. It is available on a choice of traditional solid oak boards and Strata, our unique solid oak engineered boards, in a choice of widths to 300mm and generous long lengths. Homero Oak flooring is fully finished with our matt satin hardwax oil, UV cured for additional durability and easy maintenance. It requires no further finishing after installation.